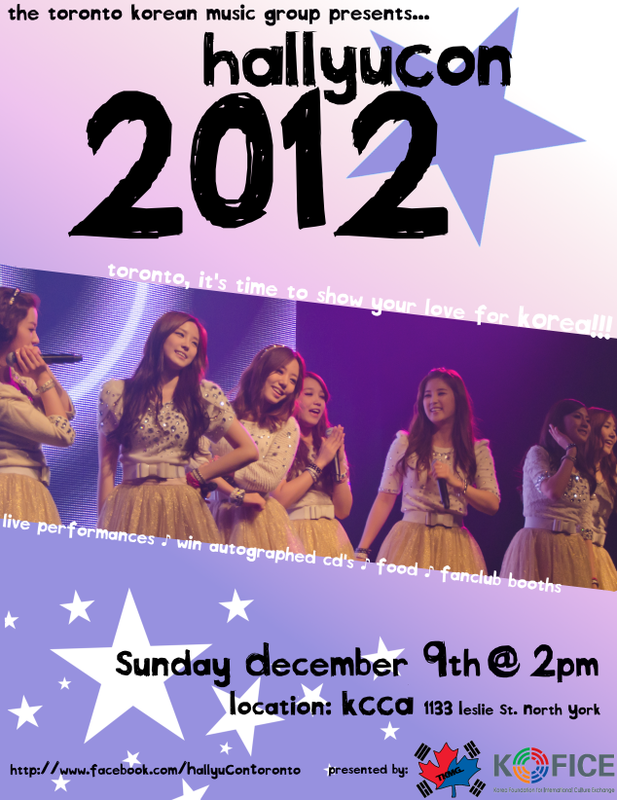 HallyuCon 2012, held on December 9th 2012 at the KCCA in North York, was the first large-scale event created by the non-Korean staff of the Toronto Korean Music Group to promote the love of KPOP and the Hallyu wave in Toronto. Selling over 500 tickets, it became the largest ‘fan-meeting’ we’ve ever hosted, and while we made many mistakes and encountered many road blocks, we’re all very proud to say that this event was a huge success. I met with Jon Medina, president of TKMG, for the first time in August, during an EXO fan meeting in Toronto. He asked me if I had any ideas for the group, and my immediate thought was of ‘Hello! Party’, a regular event that’s hosted by a few fans after a certain Japanese idol agency holds concerts in North America; sort of like an after party, by fans and for fans. I thought that if we could have these kind of events after concerts in Toronto or even free-standing, we’d be able to get the Toronto Korean Music Group’s name out there a little more and try to get KPOP fans in Toronto to be more active and vocal about their love for Korea. I never imagined such a small thought would have created something as huge as HallyuCon, but once the idea was pitched, we started doing everything in our power to make it happen. Our ‘Holy Grail’ came in the form of an opportunity to be officially recognized as a fan club by KOFICE (http://english.kofice.or.kr/), and they provided a generous sum of money as a sponsorship to help us get going with the event. At this point, it all seemed too good to be true. Our first goal, naturally, was the venue. But as this was our first time hosting anything to this level, we didn’t really know what to expect in terms of interest. When we booked the KCCA (Korean Cultural Centre in North York), it seemed like we were aiming a little too high—the biggest meetup we’d hosted in Toronto had about 60 attendees, how could we possibly attract over 400 people to our event? But as our other venue choices had too many restrictions to suit the nature of the event, we didn’t have any other option. With a lot more space than expected, our ideas began to get bigger too, and it went from what was proposed as a “KPOP DANCE PARTY” at the beginning to a mini KPOP convention, and thus the name HallyuCon was born.